Jessica Leigh Calvert was awarded the British Contract Furnishing Association One Award at New Designers in June 2014. 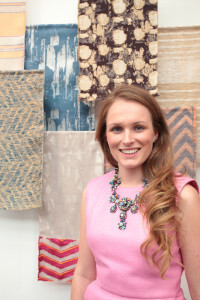 She creates handwoven and digital fabrics for interior spaces. Whilst studying for her BA (Hons) Textile Design at Central Saint Martins College of Art and Design she was fascinated by architectural landscapes and texture where she explores these ideas, combining high contrasts within her work. 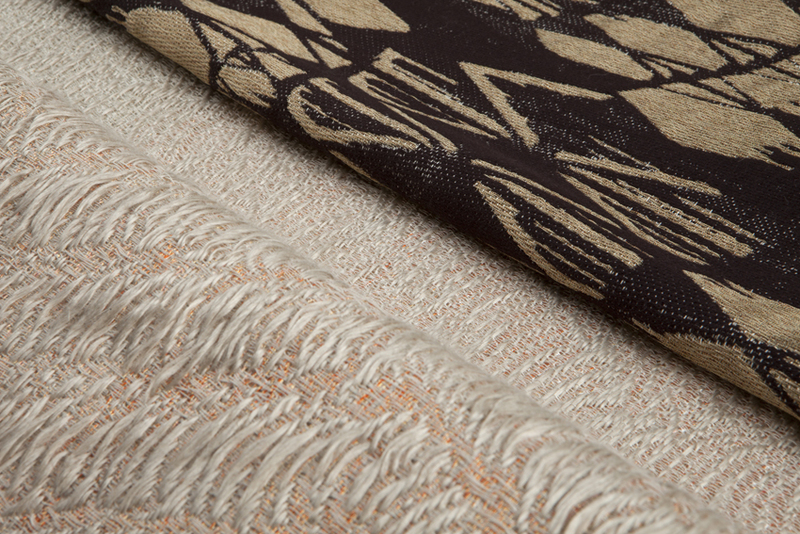 Jessica’s portfolio features woven fabrics that emulate a glamorous and tactile feel. A sensual colour palette, varied textures and exquisite craftsmanship inform her distinctive style, she also experiments with weaving techniques both modern and traditional. Jessica’s collection’s are described as subtle, timelessly elegant yet evoke a contemporary edge. Her final collection for her degree was entitled ‘Textured Disparity’ which takes its name and inspiration from a journey she took across Southern China. Within the collection she wanted to capture the elegance and bold presence of modern buildings and constructions juxtaposing the exquisite rural landscape. The collection is versatile and modern yet elegant; the fabrics emulate a rustic feel whilst adding a flourish of subtle glamourand also have a distance appeal and yet are detailed on closer inspection. The fabrics are an assortment of contrasting textures and patterns in a sophisticated palette with flickers of vibrant colour to fashion a strong statement. The textures and colour palette work effortlessly within an interior space. Jessica will have a four week internship with the design studio at FR One in Antwerp as the award prize. Thank you to Jessica Calvert and New Designers for the photos and text. This entry was posted on Friday, July 25th, 2014 at 2:54 pm	and is filed under Competitions, Exhibitions, General, New weave developments, News. You can follow any comments to this entry through the RSS 2.0 feed. You can leave a comment, or trackback.